The railway line between Gatwick Airport and East Croydon is closed after a person was hit by a train this afternoon (September 21). 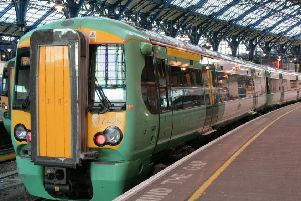 The incident is causing disruption on rail services between London and Sussex, and delays are expected until 6pm. Southern Rail said services between Gatwick and East Croydon are currently unable to run. The rail operator said: “Sadly a person has been hit by a train between Gatwick Airport and East Croydon, blocking all lines. “The power to the lines in the area has been switched off to allow Network Rail response staff and the emergency services to attend to this tragic incident. “As a result, services between these stations may be cancelled, delayed by up to 60 minutes or revised. A British Transport Police spokesperson said: “Officers were called to Balcombe Road overbridge at 2.20pm today (September 21) after a report of a person being struck by a train.